Lazy but fabulous? 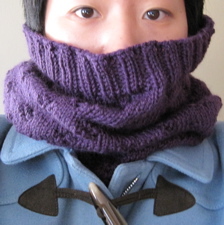 Try the "No Baggage, Please" cowl which conveniently converts from a scarf to a hat. Knit in a fabulous royal purple in a diamond pattern, it will keep you warm when Autumn winds start blowing, or if you live in freezing Edmonton. You can be practical, chic, and a complete lazyass. Triple win! Hover your mouse over the image for an alternate view.